Focus on the good stuff in life. Spending an entire day with our 2-year-old grandson was awesome and amazing this weekend. His daddy brought him over early with his “visiting bag” (diapers, clothing changes, books and sippy cup). Daddy received a half-hearted ‘bye-bye’ wave; we’re working on improving the wave, but love that he LOVES spending the day with Grandfather and Grammy. Anyway, Grandfather and I were finishing our coffee while Gabriel played with his stash of thrift-store Hot Wheels cars on the living room carpet. Thinking out loud, making plans for the day, I mentioned that we should go out to the sandbox because it’s not raining, and the little guy springs up and runs to the front door to go outside. There’s no way we’re going to say “no” to that exuberance! It’s PLAYTIME outside NOW, something that has been scarce because of a 2-week cycle of never-ending rain. This is why Grandfather and Gabriel are playing with his “Mighty Machines” (CAT Construction Toy set) in the sandbox at 9:00 a.m. I love taking photos and videos; capturing special moments and preserving memories for myself and others, but especially for Gabriel. He’ll have his own scrapbook this week with these photos (and more). We uploaded two short videos from Grandfather’s iPhone, Playtime! And another, Playtime – part 2. Enjoy! 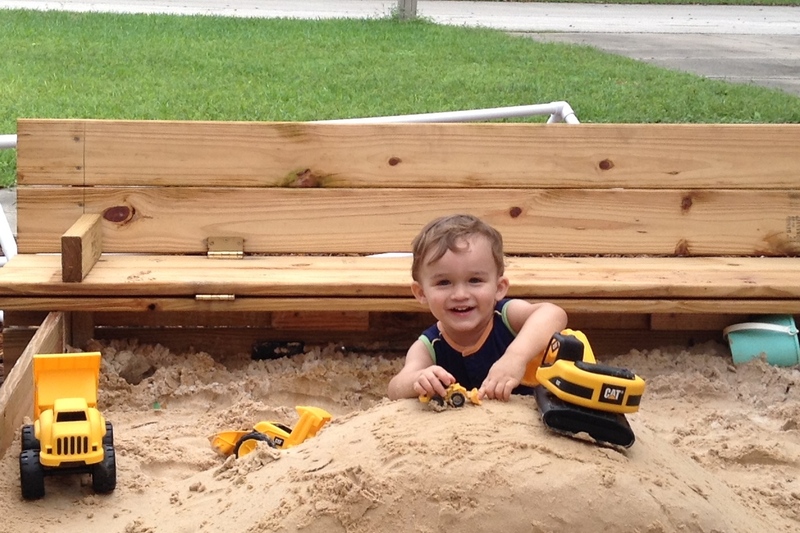 It took some negotiating, but playtime in the sandbox ended 2 1/2 hours later. We’ve got some plumbing issues in the house, so Gabriel had to take a shower (perhaps his first?) to clean up after a morning spent in the sandbox. We tried to make the shower quick and easy, using the handheld sprayer so he wasn’t traumatized by water spraying in his face, and washing his hair while he lay on the shower floor on a folded towel. More laundry for me, but there were no tears and he had a fun time doing something different, I think. No more rain! It’s sandbox time at last! Playing in the sandbox must’ve tuckered him out, because he actually slept during his nap after lunch. When he woke, we visited the Art and Algorithms Festival taking place in downtown Titusville. NASA provided an inflatable planetarium on Saturday. The three of us spent 20+ minutes watching the show (sitting on the ground), pointing at the stars and the sun and the growth of the universe as it rolled across the sphere above our heads. We enjoyed an early dinner at Caffe Chocolat included a scoop of vanilla ice cream for Gabriel, and he loved every spoonful while Grandfather valiantly kept the little guy clean with a wet wipe and I took a few photos and enjoyed him enjoying his ice cream treat. A scoop of Vanilla Ice Cream is a Special Treat! Gabriel got permission to spend the night with us, so we headed home in plenty of time to meet his 7:00 p.m. bedtime. We had a few minutes to spare because he’d had a shower earlier in the day and wouldn’t need another, so Grandfather wracked his brain for a last hurrah for the day. 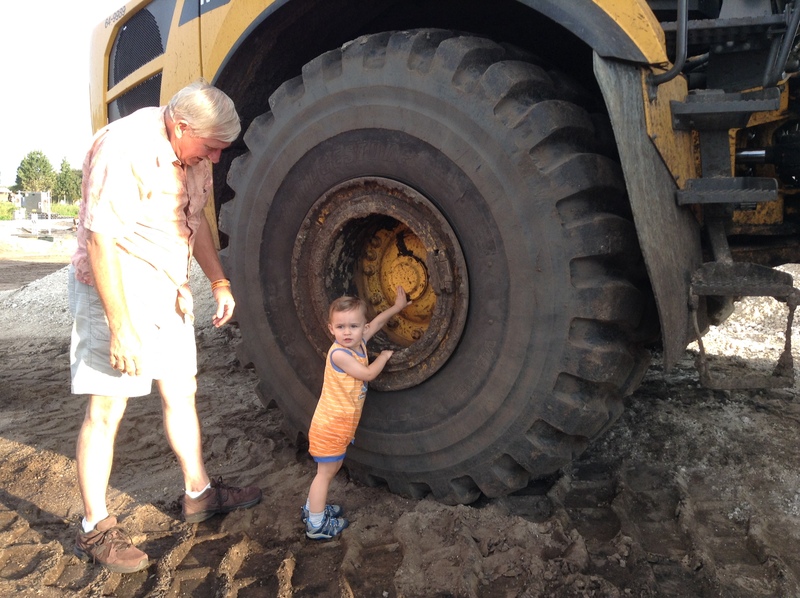 Grandfather drove to a local construction site and saw some “mighty machines” up close for yet another treat for this special boy who fills our lives with joy. You should have seen his little eyes light up! Oh, I think I have a photo of that moment! 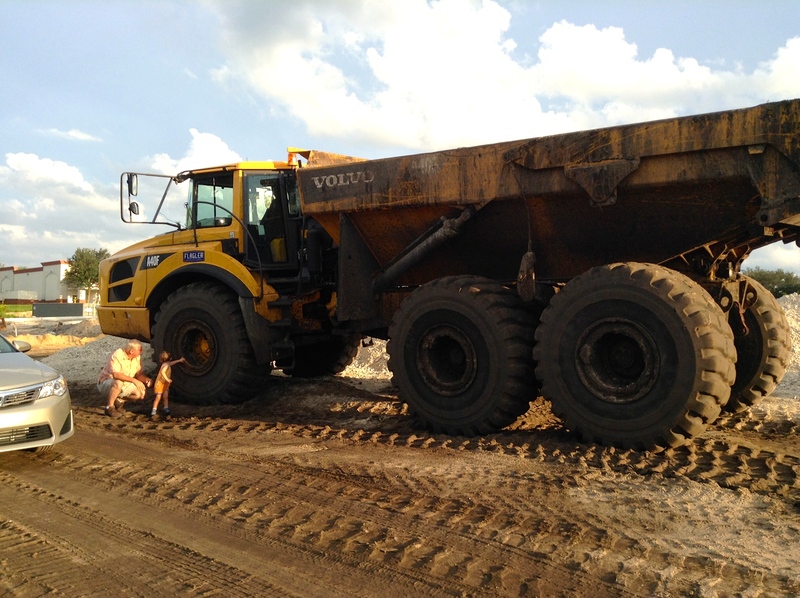 Dump Truck — Mighty Machine Style! I’m learning the names of each “mighty machine” … Excavator, Steam Roller, Grader, and Dump Truck, (and others) because learning real names of people, places and things is important for vocabulary development and effective communication. The mighty machines we enjoy in his world of play, watching “Mighty Machines” on Netflix and seeing/touching in real life are great experiences we’re blessed to have with him and look forward to sharing with Benjamin when he gets a little older. This entry was posted in Childhood, Entertainment, Family, Outdoor Activities, Toys and tagged grandchildren, grandparents, mighty machines, toddler fun by Benmo. Bookmark the permalink. 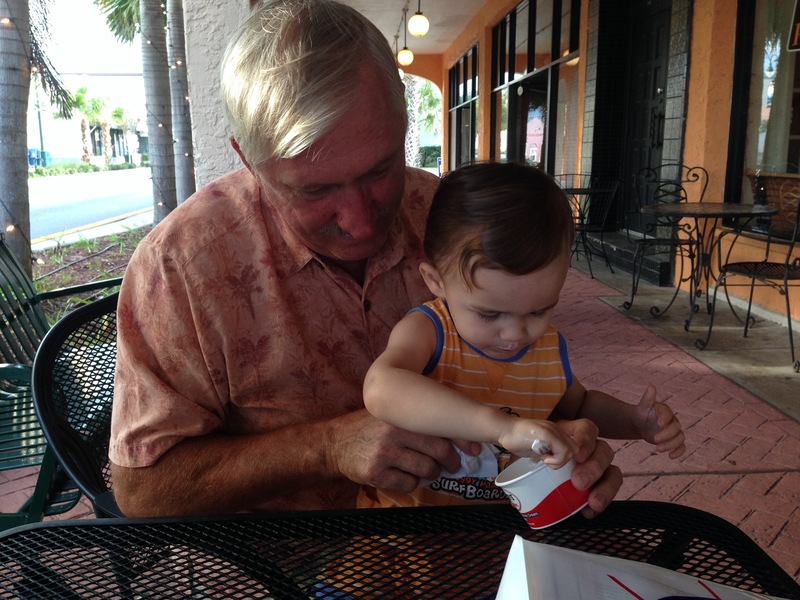 Has it occurred to you that grandson is “enabling” grandpa to experience the childhood we never had! Never too late to play! 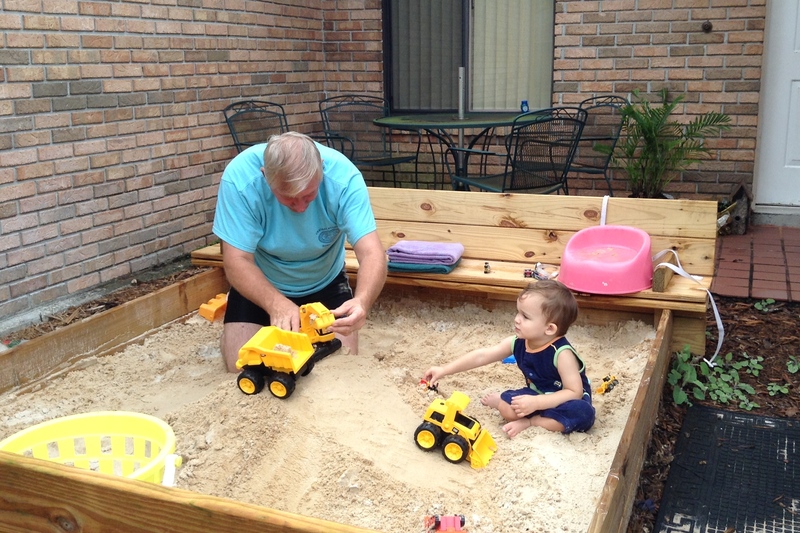 Now that the weather’s cooling off, sandbox time may dwindle. Sure hope we get the bathtub working again soon! I miss soaking in a hot tub!